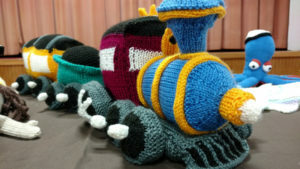 Robin Keller, who currently writes the Guild newsletter, has been knitting since she was a little girl. At ten years old, she used her brother’s drumsticks to knit a scarf in music class, and right away, she was hooked. She loved the fact that you can turn yarn into anything, whether it’s something fun or practical. Like many of us crafty folks, Robin likes to see quick results when she’s creating. So rather than create large pieces that may take awhile, she likes to knit smaller pieces like socks and mittens. She also gets super creative with her pieces – she creates three-dimensional plush kids toys such as dolls and animals. Her pride and joy is an intricate 4-piece knitted train set. Her favorite subjects to create? Dragons and dinosaurs! For new ideas, she gets her inspiration from magazines and stores. Her latest exciting new idea are zombie dolls which are both gruesome and fun – their parts are held together with snaps, so you can rip off their appendages and heads, and snap them back on! Robin offers an expert tip for crafters who’d like to try their hand at knitting plush creations – line the inside of the toys with tulle, so that the stuffing doesn’t come out of the spaces between the stitches. She also suggests that seamless designs are more visually appealing, so she prefers to knit in the round rather than create separate pieces to sew together later. 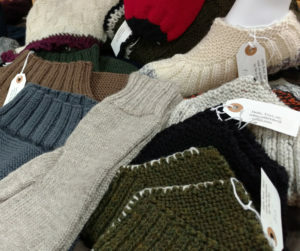 Some other crafts she’s delved into throughout the years include sewing, spinning, and weaving. Robin sells exclusively at craft shows, doing just one or two per year. If you’d like to see her beautiful work in person, you can visit her at the next Erie Guild of Craftsmen Fall Craft Show!